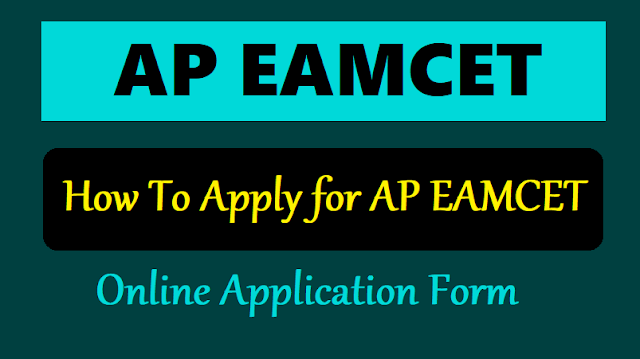 AP EAMCET 2019 Application Process Begins at sche.ap.gov.in/eamcet, Apply Before 29th March 2019: AP EAMCET 2019 notification has been released for the Andhra Pradesh Engineering, Agriculture and Medical Common Entrance Test 2019 which is scheduled to be organized by the Jawaharlal Nehru Technological University (JNTU) Kakinada. JNTU, Kakinada will organize the entrance exams from ... April 2019 on behalf of APSCHE for candidates seeking admissions to the First Year of various professional courses viz Engineering, Bio-Technology, B.Tech (Dairy Technology), B.Tech. (Agr. Engg. ), B.Tech. (Food Science and Technology), B.Sc. (Ag)/ B.Sc. (Hort)/ B.V.Sc. & A.H/B.F.Sc and B. Pharmacy, Pharma D offered by Universities and Private Colleges in the state of Andhra Pradesh for the academic session 2019-2020. As per the official notification the examination will be organized in two shifts. Candidates interested in appearing for the APEAMCET 2019 must follow the instructions below and apply online on or before 29th March 2019. AP EAMCET 2019 online application process begins @apeamcet.nic.in: The Engineering Agricultural and Medical Common Entrance Test (EAMCET) application process is beginning from February 26, 2019. In this regard, an official notification was released on February 20, 2019. Interested and eligible candidates can apply for the AP EAMCET examination online through the official website - https://apeamcet.nic.in/. Candidates need to submit Rs 500/- application fee for Engineering (E) and Agriculture (A) and Rs 1000/- for Both Streams. EAMCET is an entrance exam for admissions to some engineering and medical colleges in the states of Andhra Pradesh and Telangana. Candidates applying for the common entrance test must be at least 17 years at the time of applying. Candidates need to clear the 12th board exams with respective subjects. Candidates have to pay 500 Rs. for the application fee. The last date for applying is March 27, 2019. The eligible candidates are advised to go through the official notification before applying for the entrance examination. Visit the websites for further details. AP EAMCET 2019 Engineering exam is conducted for the candidates who wish to take admission to the (a) Engineering, Bio-Technology, B.Tech. (Dairy Technology), B.Tech. (Agr. Engg. ), B.Tech. (Food Science and Technology), (b) B.Sc. (Ag)/ B.Sc. (Hort)/ B.V.Sc. & A.H/B.F.Sc, (c) B. Pharmacy, Pharma. D undergraduate courses. Lakhs of the candidates apply for the examination to secure a seat for themselves in the desired courses mentioned above. The AP EAMCET examination is scheduled to be conducted on April 20, 22 and 24, 2019. And according to the notification the AP EAMCET Admit Card/Hall Ticket will be released on April 16, 2019. Candidates should note that the AP EAMCET will be a three hours computer based test with MCQ type questions in Physics, Chemistry and Mathematics. How to apply for APEAMCET 2019? Applicants are required to pay an application fee of ₹500 for one exam and ₹1000 for both i.e. Engineering and Agriculture.